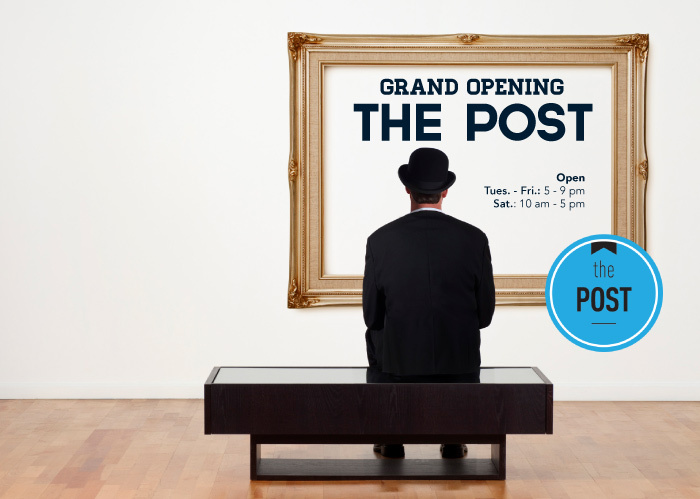 McMurray Musings: Grand Opening of "The Post" - A New Art Gallery in Town! Grand Opening of "The Post" - A New Art Gallery in Town! Last night as part of the winterPLAY schedule of events I was delighted to attend the grand opening of a new venture - a volunteer-run art gallery in the basement space by the Keyano Theatre lobby. The new gallery is called "The Post", and it is designed to bring art work to Fort McMurray that otherwise we may need to travel to see, as well as showcasing local artists. Now, if you have lived in Fort Mac as long as I have you might remember that there used to be a gallery in that same space. It has been closed now for some time, and it was sad to see that empty, shuttered space whenever I attended the theatre at Keyano. Last night that quiet spot sprang to life again with an exhibit from two Alberta artists named David Janzen and Julian Forrest, and local residents toasted the new gallery with champagne. Running an art gallery in this city is a tricky thing, especially when it is volunteer-driven and organized. Volunteer curator/director Connor Buchanon has taken this project on, and I suspect it will flourish in her capable hands, and in a renewed climate of interest in arts and culture in this community. Connor is also responsible for the Wood Buffalo Culture blog, a tremendous place for information regarding arts and culture events in the region (and a resource I refer to often). The exhibit currently on display is fascinating, with David Janzen's work focusing on space shuttle launches depicted on various surface media, and Julian Forrest's intriguing depictions on the theme of "tension" (I found the coyote paintings most interesting). The Post is an Events Wood Buffalo initiative, but it is intended to be volunteer-operated. There is a need for volunteers to be present at the gallery during opening times, and there will be opportunities for these volunteers to pursue professional development training in relation to the gallery (as well as receiving gallery training). If this is of interest to you I would encourage you to contact The Post, as it is a chance to get in early on what I suspect will be a grand success in the thriving arts scene in our community. The Post will also be the spot for the upcoming launch of the latest edition of NorthWord, that regional literary publication near and dear to my heart. The official launch of issue number six, "Sinful", is on February 24th from 5:30-8:30, and is billed as "An Evening of the Arts", a chance to enjoy visual art, music, and literary works. 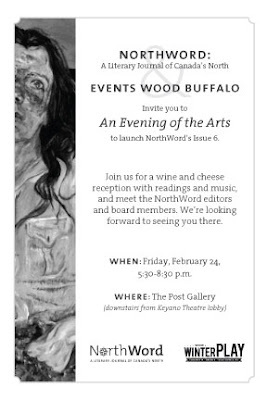 There will be literary readings, wine and cheese, and a chance to meet the NorthWord editors and board. Added to the opportunity to see the new exhibit at The Post it sounds like a wonderful evening indeed. So, people, we have a new art gallery in town, and it is already hosting things like launches of literary magazines. I've been saying for some time that we are on the cusp of something in this community, not just the leap from small town to urban centre, but I think a renaissance of our arts and culture scene. The grand opening of The Post is simply another bit of evidence I'm adding to the growing pile convincing me of this fact. I encourage you to go and check it out - and I think you'll be convinced, too. The hours at "The Post"
are Tues-Fri 5-9 pm, and Sat 10-6.
downstairs from the Keyano Theatre lobby. from 5:30 to 8:30 pm.